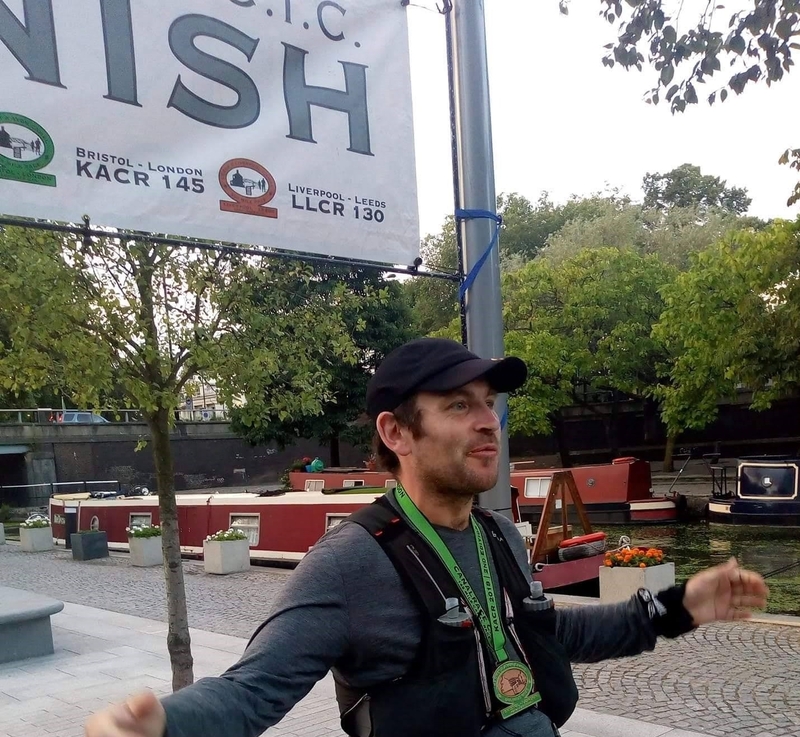 I made the fatal mistake of saying to the guy next to me, around halfway through the Green Man Ultra on Saturday, that “this is probably the easiest ultra I have done so far…”. Never a sensible thing to say on a course you don’t know, that you have to navigate yourself and you are 20 odd miles from the finish. By the end of the race, I regretted that statement. In terms of terrain, yes, it was the easiest ultra I have done to date, but with a finish time two minutes shy of 10 hours for a 44 mile course, it doesn’t take an astrophysicist to work out I averaged 4.4 miles per hour, or just under 15 minute miles. That is not quick, even by ultra standards. 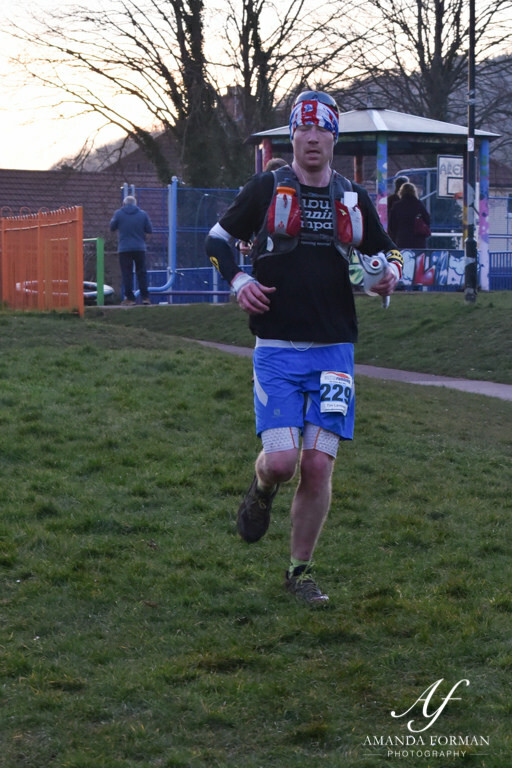 To put it in context, I ran nine and a half hours at the 47 mile Brecon Beacons ultra, which is far tougher in terms of terrain or just 12 minutes slower at the North Downs Way 50 mile race when I was much less fit than I am now. Quite simply, this race threw me because it wasn’t marked and I didn’t have a GPS. Using the maps, navigation wasn’t a huge issue but it took a lot of time stopping, checking and making sure I was going the right way- even when I teamed up with Christian Maleedy for the last 20 odd miles. One of the things that was toughest was even when having determined a route, I didn’t run with full confidence and therefore full speed, as I was second guessing myself a lot. The whole race I felt like I was holding back and never really running with a rhythm. I am pretty sure I wasn’t the only one who felt this way. That said, I entered this race to get out of comfort zone. It is a classic British race now and one I have wanted to do for a couple of years, but hadn’t managed to squeeze in. I understand where we started from and finished this year, in Long Ashton, is new as a headquarters but you wouldn’t have known it. 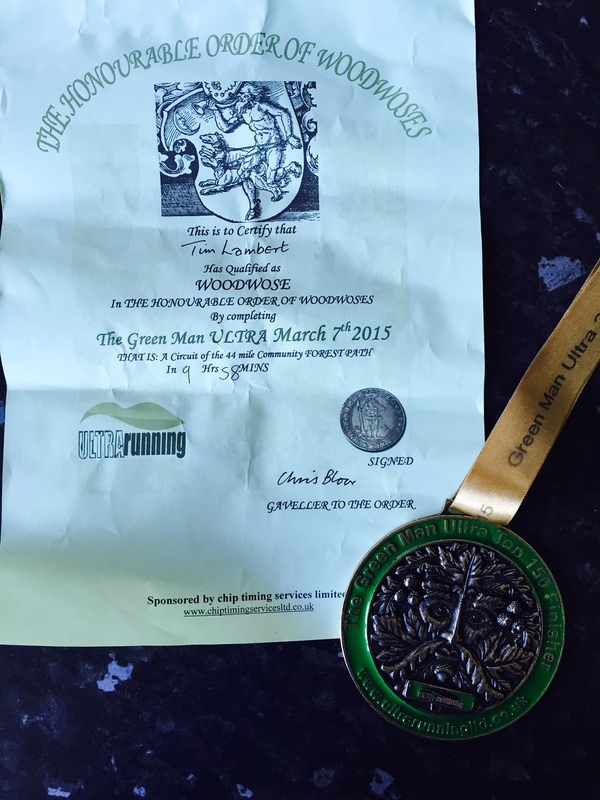 This is the first race I have done with Ultrarunning Ltd and I have to say they were fantastic. Certainly more low key than Centurion, but equally passionate and with great volunteers and aid stations that had everything I needed. Whilst the medal is already in the garage, it is one of the most impressive ones I have ever seen and was a big motivator when I was having low spots. I wanted that medal. Once registered, I had the usual slightly nervous/apprehensive chats. I met Dawn Riden for the first time face to face as well as Roz Glover who I had seen the weekend before at the CW50K. Stu Wilkie was also there, last years winner, as well as Dennis Cartwright who I haven’t seen since the North Downs 100. But mainly I was chatting to Ian Walker. Now, Ian has annoyed me here. Because he has ruined one of my excuses for a poor time at this race. I would have said that running a 50K the weekend before this race wasn’t sensible, but then Ian goes and comes 16th in 8:07 and Bryan Robb runs in 4th in 7:20. Both ran last weekends 50K with me. Inconsiderate bastards. For the first 10 miles of the race, we headed South and then West around Bristol towards Keynsham and then headed North. The first 10 miles were by far the hilliest ones but even then, nothing like the Cotswold Way or the North Downs. 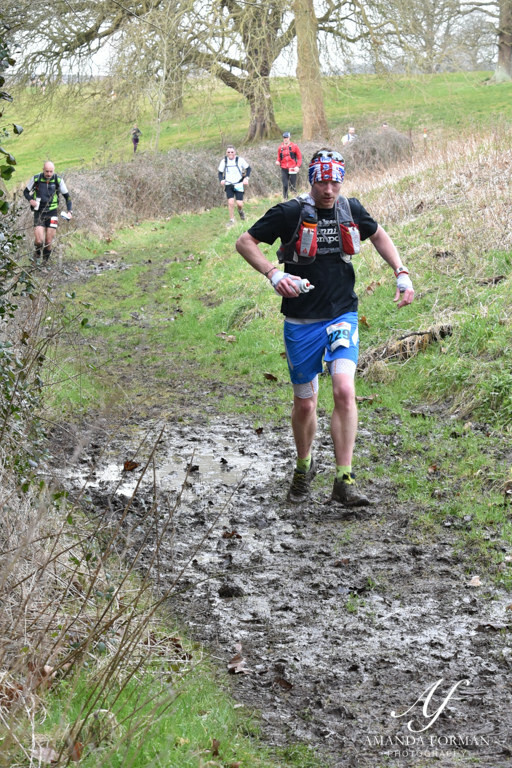 Everything was very runnable, but very muddy. Navigation wasn’t an issue as we were still a big pack by then and it was also very rural, so there was only one or two paths we could follow. It was the urban sections that threw me where there were multiple route choices, but more of that later. I got into a good rhythm here and was running well within myself and pacing fine. It was turning into a stunner of a day and I am probably one of very few people who can say they got sunburnt on March 7th in England. That is quite a skill, even for a ginger. As always, I had a few chats but preferred to run alone and just enjoy some me time. I find running these races is one of the few times I am truly alone and whilst I like company, its nice just to be by myself sometimes. As I have learnt through some work psychological profiling recently, whilst I have a people oriented role in work, I am a natural introvert and I like solitude when the time is right. Check Point 1 came and went in just over an hour, seven miles in, and I had a quick chat with Darryl Carter who was volunteering (and held the course record until later that day), before filling my bottles and getting back out. 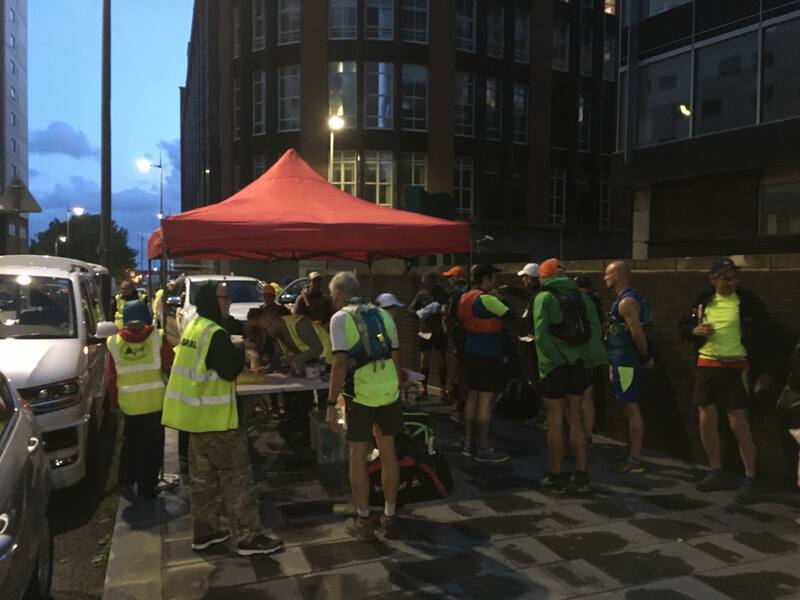 CP2 came an hour and a half later and I was well on for a circa 8:30 finishing time, which was way up on what I was expecting. Between CP2 and CP3 is a bit of a blur but this was a much longer section with around 12 miles to cover. I only filled two bottles so had just over a litre of water for this, but had underestimated the time it would take so the last three miles I was dry. When I finally reached this checkpoint, I needed a few minutes to re-hydrate and get some calories in. The one thing I am most pleased with during this race was how well I ate and digested. 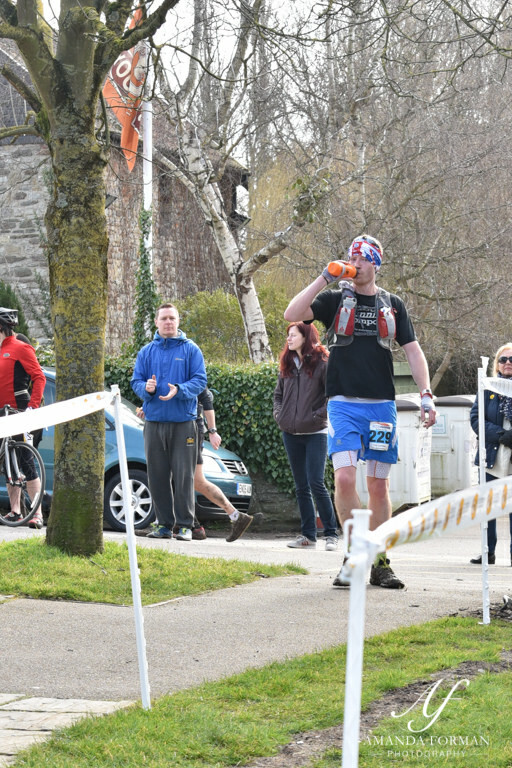 I absolutely stuffed myself at each aid station with typically having a few cups of coke, three cheese rolls, some cake, a 9 bar and taking a couple of gels with me. I didn’t once feel sick and ate between checkpoints with snickers that I was carrying. Energy wise, I felt great the whole day. One of the race sponsors was Red Bull and these were available at each aid station, but I wasn’t even tempted. I don’t even like caffeinated gels and the only caffeine I have at races is Coke, but I would prefer sprite if it were available. My heart rate gets high enough without caffeine and I don’t like mixing it with exercise. This is just a personal thing, but I did see others guzzling the cans and clearly it works well for some. I arrived at CP3 with Christian Maleedy and we spent probably six miles before this together and then the rest of the race. Our pace fell in step and whilst I am not usually that talkative, we spoke a lot and it just helped the miles click by. I felt we got to know each other quite well during the race and from polite chat at first, that migrated to full on swearing and piss taking by the end. So much so that when I fell over a couple of miles from the line and with us chasing down a time still starting with a 9, he was laughing at me as I swore and laughed myself. We just had a laugh and neither of us took it too seriously. 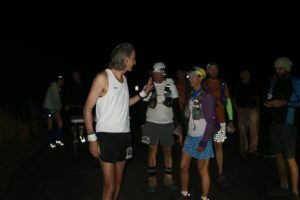 One thing we did talk about a lot was that if someone handed us a headtorch and a refill of the bottles at the finish and said do it again (which still would have been 16 miles shy of a 100 mile race) there is absolutely no way in hell we could have. It is amazing that you really can run the distance you tell yourself you will in your head, but not a step further. That is why the piece of string run is such a fascinating concept. 44 miles was our limit that day and we were chasing down the daylight to get in by 6pm. Between CP3 and CP4 was where things started to go array. We found ourselves lost a couple of times and backtracking or second guessing where we were. By now the field was spread out, but without a GPS between us Christian was looking at the written directions and I was following the map, trying to agree the route. The map provided was not hugely detailed so it was easy to miscalculate a turn. We ended up taking about 45 minutes longer than we expected because of these issues here and whilst we were both physically fine after 30+ miles, we were frustrated at times when lost but shrugged it off. Neither of us are hugely competitive, but nevertheless we both wanted to get finished in the best time we could. Eventually we hit CP4 which was in a park with some beautiful features, especially by the gates as you entered by the manor house. There weren’t many things of beauty on this run, but this was absolutely one of them as the sun lit up the features here. We refilled, had some soup and realised we had two hours and ten minutes to get to the finish, approximately 8 miles away. Sounds very easy, but we knew this was a very urban section coming up and would involve lots of concentration as we headed into Clifton and into Long Ashton to close the loop. Here we entered a huge park and it was just two miles to the finish, maybe three. We met a guy here going the complete other direction to us and whilst we found this odd, we stuck to the map and then got a little lost. We should have followed him, but it just didn’t feel right and our gut had got us through most of the day. We came out of the park and realised we were too far south so had to follow the main road back up to where we should have crossed. By now we had just 25 minutes to get in under 10 hours and I was very focussed on getting in by that time. For some reason, a 9 was acceptable and a 10 was absolutely not. We both agreed on this. This is where I tripped and cut my leg, we then decided the road was a little dicey in the dusk so crossed the road prematurely and climbed a steep hill. We then had to vault a wall and finally found ourselves on the wrong side of the right golf course. We crossed it and eventually joined the correct route with arrows spray painted for the last half a mile guiding us in. As we found this path I remember shouting to Christian that we had 7 minutes to get in under 10 hours. He then did his best Kilian impression and bounded down the hill like a gazelle with me limping along in his slipstream. Finally we came out of the woods as I shouted “4 minutes” and we entered the finish turn as I shouted “2 minutes!”. 9 hours 58 minutes and 30 odd seconds. We had done it. 106th and 107th place respectively. We both agreed we will return next year now we know the route and both with GPS watches. I firmly believe we could take an hour and a half off our time, but that said the weather was amazing considering it is only just Spring and on a wet and windy day, our times would have been pretty decent. In fact, prior to this year we would have been in the top 100 fastest times ever “hall of fame” on this course. It just shows how much slower this course is in bad weather. Certificate and that fantastic medal. All in all, a cracking race and I can’t recommend it enough. Now, just six weeks until the Thames Path 100 on May 2nd.